What is Eczema? Can Eczema be Treated? Eczema/dermatitis is a rash-like skin condition which can show symptoms anywhere on the body. 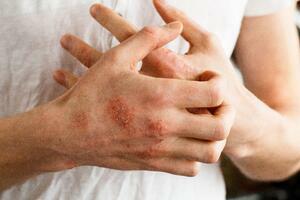 Simply put, eczema is a condition that causes a person’s skin to become red and itchy. It may start as a simple rash, but when scratched the skin becomes inflamed and even more red. Read on for more information on what causes eczema, what it looks like and most important how to ease your symptoms. WHAT ARE THE DIFFERENT TYPES OF ECZEMA/ DERMATITIS? Atopic dermatitis, also referred to as eczema, dermatitis, atopic eczema and atopic dermatitis, occurs in children and babies, but can last into adulthood. Usually, it shows up as extremely itchy, scaly patches on the insides of the elbows, behind the knees and on the face but it can appear anywhere on the body. Contact dermatitis happens when your skin is exposed to an allergen. I can occur because you’re allergic to something or because it simply irritates your skin. For example, poison ivy causes contact dermatitis. Seborrheic dermatitis is a chronic form of eczema and usually affects areas with large numbers of oil glands. In adults, this is usually the scalp, eyebrows, side of the nose and chest. In infants, it often appears on the scalp as cradle cap. The affected areas often have a whitish and flaky appearance. Seborrhea may be caused by a yeast. People with this type of eczema seem unable to process the yeast properly, and the irritation occurs. Hand Eczema shows up as redness, itching, dryness, peeling, flaking, cracks and blisters. It can be debilitating and highly uncomfortable. Pompholyx, also called dyshidrotic eczema, is a specific type of hand eczema that can also show up on the feet. It appears as very tiny watery blisters on the palms, inside the fingers and on soles of the feet. The exact cause of pompholyx hasn’t been determined but seems to be affected by emotional stress, sweating and exposure to metal compounds. Nummular Eczema, also referred to as discoid or nummular eczema, appears in coin-sized projections that are bumpy. These patches usually appear on the lower legs, torso or forearms. Neurodermatitis/Lichen Simplex Chronicus is similar in appearance to atopic dermatitis and is exacerbated by scratching or rubbing. It may result from insect bites, stress or nervous habits and can cause the area of skin to thicken and discolor. Stasis Dermatitis results when your body can’t send blood back to the heart efficiently. Eventually, the pooled blood in the legs affects the skin on the legs with swelling, redness, scaling, pain and itching. Over time, severe cases can lead to oozing, cracking, ulceration and infection. Avoid long hot showers. Hot water strips moisture from the skin faster than warm or cool water. Keep showers short, 10 minutes or less and use warm water instead. Apply cream or lotion while skin is damp. Bathing allows water to enter the skin so putting on moisturizer following the shower while skin is damp seals in moisture. Be mindful of clothing/materials that can irritate skin. Dress in soft, breathable clothing and avoid itchy fabrics like wool that can further irritate eczema. People who suffer from eczema have a hard time finding products that don’t irritate their skin because how of fragile the skin is. Choose products specifically formulated to treat the symptoms of eczema, and that are gentle and fragrance-free. The moisturizers for eczema should help seal moisture in the skin. Look for products with ingredients like colloidal oatmeal, shea butter, hyaluronic acid and ceramides; these moisturizing ingredients repair and protect the skin and relieve itching and irritation. Colloidal oatmeal specifically is an FDA designated skin protectant that relieves itching and minor irritation caused by eczema, rashes and other skin conditions. Avoid fragrances, harsh ingredients and alcohol-based products as they can trigger flare-ups and dry out skin. Corticosteroid creams and ointments can be prescribed by your dermatologist. Antibiotic creams or oral antibiotics can be prescribed if the skin is cracked or has open sores. Oral corticosteroids may also be prescribed if the infection is severe enough. These can not be prescribed for an extended period of time because of possible side-effects. New injectable biologic (monoclonal antibody) called dupilumab is used for those who have a severe condition and do not respond well to other treatment methods. Wet dressings that are wrapped around the infected area after application of corticosteroids. These are usually very effective and used in severe cases. Light therapy is used when an infection flares up or topical treatments are not effective. This form of treatment begins with phototherapy. This procedure exposes the infected area to controlled amounts of natural sunlight. However, if this proves ineffective, then artificial UVA (ultraviolet A) and narrow band UVB (ultraviolet B) rays will be used along with medications. Eczema can be a frustrating condition to live with. The Dermatology Center for Skin Health wants to do everything possible to help you understand what is causing your eczema and provide treatment. Our priority is to deliver complete, compassionate care to our patients while educating and assisting them as they make care decisions regarding the health and beauty of their skin. With more than 20 years of experience, the Dermatology Center for Skin Health’s purpose is to inform and assist patients as they make care decision regarding the health and beauty of their skin.